Bean and vegetable soups are what I lean on when either my budget or my time (or both) is limited. We always have dried beans and jarred tomatoes tucked away in the pantry. When you tuck them into a pot with good broth and plenty of vegetables, they come together to make a wholesome, fast and inexpensive soup. 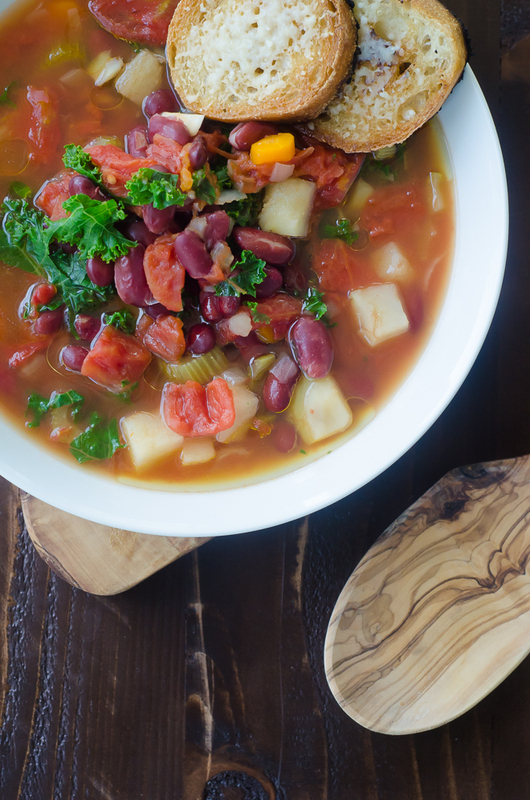 Hearty kidney beans and starchy Russet potatoes fill out a tomato-rich broth that’s dotted with aromatics like carrots, celery and onions. The combination is utterly simple and uncomplicated, but flavor-forward and deeply satisfying, especially when paired with toasted bread and a salad. Kidney beans, as well as chickpeas, lentils and split peas, are pulses. Pulses are budget-friendly and easy to stock in your pantry. They’re also a good source of micronutrients like folate, choline, magnesium and phosphorus, especially when soaked overnight which improves the bioavailability of minerals. 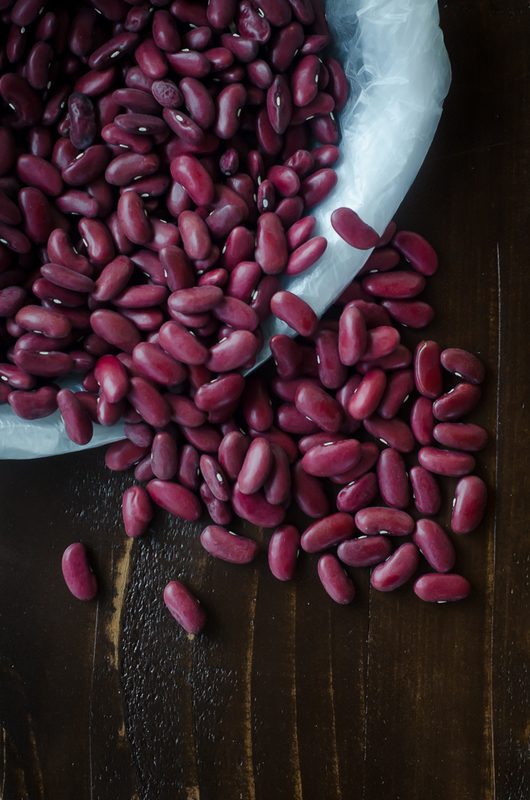 Not only are pulses, like kidney beans, a good source of B vitamins, minerals and other nutrients, but they’re also can be grown sustainably in a variety of climates (we often find pulses tucked into our weekly CSA box) which is why, in part, the UN recently named 2016 the International Year of Pulses – shining light on their value. I’ve partnered with USA Pulses and Pulse Canada to share this year’s Pulse Pledge – a commitment to enjoy pulses (like chickpeas, beans, dry peas and lentils) once a week for ten weeks. When you take the pledge (sign up here), you’ll get tips, recipes and be entered in to win giveaways. Dump the beans in a colander and pick through them, removing any stray bits of debris you see. Rinse them well, and then pour them into a medium mixing bowl with a tight-fitting lid (I use this set.) Cover them with hot water by two inches, and then stir in the baking soda. Allow the beans to soak at least 8 and up to 24 hours. Drain and rinse well. Dump the beans into the insert of an electric pressure cooker. (We use this one.) Cover with water by three inches, and then spoon 1 tablespoon olive oil into the pot. Pressure cook the beans for 25 minutes, until tender but not soft. Drain the beans, wipe out the pressure cooker's insert, and return the beans to the pot. Drop carrots, celery, onion, garlic and potatoes into the pot, pour in the broth and jarred tomatoes, and then drizzle with remaining one tablespoon olive oil. Pressure cook for 15 minutes. Stir in the kale, return the cover to the pot and let the kale cook in the residual heat of the soup until tender, about 5 minutes. Salt as needed, and serve warm. What if you don’t have a pressure cooker? This simple bean and vegetable soup calls for a pressure cooker (like this one). 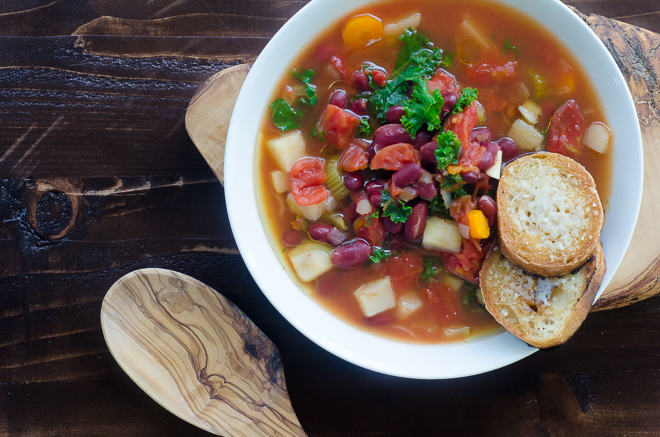 If you don’t have a pressure cooker, you can make this soup by soaking the beans, boiling them until tender and draining them. Then sweat the vegetables in the olive oil with a pinch of salt until crisp-tender. Toss the cooked beans into the pot with the vegetables, broth and tomatoes, simmering them all together until tender, about thirty to forty minutes. Thanks for the tip on treating the beans if you don’t have a pressure cooker! Looks fantastic. Do the vegetables need to be organic? No, the vegetables do not need to be organic. Organic status typically does not impact how well, or whether a dish will come together. By and large, we generally purchase organic in my home, but that doesn’t mean you have to.